Between the three of us it seems we have walked just about every beach in the Eastern Caribbean and have seen a good portion of the luxury villas available throughout the islands. 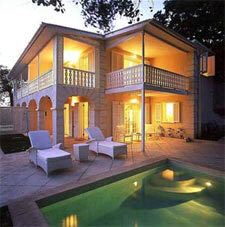 But Mustique has the finest collection of luxury villas we have ever seen. They are truly over-the-top gorgeous, each one unique and exquisite in its own way. Oliver Messel designed several of the popular (along with several of the secret) villas, including Yellowbird, Les Jolies Eaux and Gingerbread, while many of the others have a distinctly Asian flare. One of Bethany's favorite was Sleeping Dragon. Located on five acres of gardens just north of Macaroni Beach on its own private bay, the villa is a luxurious fusion of classical Chinese and Caribbean architecture. A central pavilion houses two master bedrooms and a living room with stunning views. There are separate pavilions for two additional master bedrooms and children's bedrooms. A gazebo alongside the 70-foot pool houses a dining area with sweeping views of the Caribbean Sea. Serenissima, another Asian-influenced villa, overlooks a lush valley with views of the Atlantic, the Caribbean and neighboring islands. It is a Balinese-style villa with polished wood floors, canopied beds and Indonesian antiques. Surrounded by a lily pond, it lies just steps away from Macaroni Beach. Villa choices range from those with easy access to Mustique's small village and quiet beaches, to villas hidden in the hills or, like Point Lookout, villas built on their own secluded beaches. Two villas popular with families are Blue Waters, perched on the northern end of Endeavor Bay near an excellent snorkeling beach, and Alumbrera, a luxurious villa above Macaroni Beach that includes bedrooms with bunk beds for children. Many of the homes on Mustique have been featured in Architectural Digest. There are currently 89 private villas on the island and 55 of them are available for rent. We felt fortunate to have had the opportunity to see so many fine homes and to be able to offer this caliber of accommodations to clients. While on the island we stayed at Liselund, the former home of the manager of Mustique Company. Tucked into the northern hills, the four-bedroom villa is cooled by the tradewinds and commands a picturesque view of neighboring islands. Our days were bookended with an energizing morning swim at Macaroni Beach and a relaxing evening dip in the calm, warm sea. Our staff presented us with delectable choices at mealtimes, serving fetticcini alfredo, grilled mahi and even homemade pizza piled high with fresh toppings. We found ourselves unable to turn down second helpings! Upon request the staff can make a picnic lunch that guests can bring to the beach, or have a staff member bring to the beach. One afternoon we noticed our staff making a meal of grilled breadfruit and callaloo soup for themselves and asked if we could join them to taste these local favorites. It's no secret that the rich and famous retreat to Mustique for privacy and serenity. Mick Jagger and Tommy Hilfiger are just two of the celebrities who own homes on the island. This eclectic mix of English royalty, rock stars and affluent international guests make for some interesting evenings at the gathering places in the village. Every Tuesday night the Mustique Company sponsors a cocktail night at the Cotton House Hotel. So we decided to join the English lords and local schoolteachers for an enjoyable night of rum punches and island gossip. The Cotton House Hotel is a restored plantation house and sugar mill set amid lily ponds and flowering tropical splendor. Oliver Messel designed the guest cottages and pool complex and the boutique hotel includes a white sand beach and tennis courts. The newly opened spa, decorated in soothing hues of lavender and blue, reflects the serenity and beauty of the nearby sea. While there we could see the candles flickering in the dining room set with cobalt blue china for a formal evening meal. (Note. The Beach Café, under construction while we were there, is now open.) Basil's Bar on Britannia Bay is the place to be for Wednesday night "Jump Up." Each week the well-heeled rub elbows with island guests, visiting yachties and locals for authentic island grub and lively steel drum music. You never know who you might run into at Basil's. 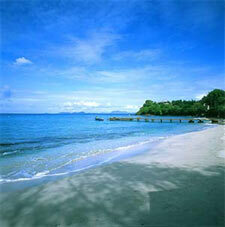 Mustique's tiny village includes three fine boutiques, the Sweetie Pie Bakery and a grocery store. Inside the grocery we found an interesting mix of fine wines and foie gras alongside plantains, yams and sweet potatoes. One afternoon we stopped across the street from the grocery store to watch the local fishermen unload their catch of grouper, snapper and lobster destined for the island's kitchens. The days seem to drift by in a blur. Each day we thought about hiking one of the island's many top-notch nature trails that showcase the hardwood hammocks and mangrove forests. We even thought of arranging a horseback ride with the Equestrian Center or playing a few games of tennis at the Tennis Club. We knew that sailing charters, surfing, SCUBA diving, kayaking, even golf (on nearby Canouan Island) were all available, but that's one of the great beauties of Mustique --- the emphasis clearly rests on the simple things and the villa life. The "activities" and "sight seeing" becomes an ethereal possibility instead of a "must see, must do." Life seems to slow down and we found ourselves talking in hushed voices for no apparent reason at all. As the sun set on our final day on Mustique we spotted the green flash once again. Science says we must understand the mirage before we can understand the science of what's real, but under the sway of a cool Caribbean breeze brushing across the beauty of the island, the thin line between reality and fiction blurs easily on Mustique.